The classic fruity has been reinvented in Double Stacks slot machine with free spins, stacked symbols and an incredible light show in this new video slot by Netent. 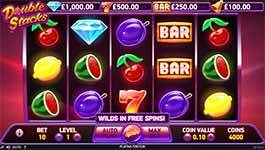 This 5-reel game has 10-paylines of traditional gaming that illuminate with colourful lights on big wins. You can earn those big wins with the Double Stacks feature, wilds and stacked wild free spins and get up to 1000x your bet per spin! Wild Stars – The Wild symbol substitutes for all symbols in the game except the scatter to complete winning combinations when possible. Maximum Payouts – The fields at the top of the screen show the maximum cash win for these symbols, this is the amount that will payed out if the entire reel area is filled with the corresponding symbol. Stacked Symbols – Only the 4 highest paying symbols can appear stacked on the reels in the main game. Double Stacks Feature – When a reel stops and all symbols on it are of the same kind, all symbols on the reel will double. The symbols on this reel will then count as two symbols instead of one when calculating wins for this spin. Free Spins Feature – Land three, four or five scatter symbols anywhere on the reels to win 5, 15 or 30 free spins respectively. During Free Spins, in addition to the 4 highest paying symbols appearing in stacks on the reels, Wild symbols also appear either on the reel or in stacks. During free spins, 2 or more scatter symbols appearing anywhere on the reels will award additional free spins.